It is estimated that currently, about 80 million of American people suffer from hair loss, from severe to moderate. There is a great deal of causes of this problem, but the outcome is usually the same with everyone: decreased self-esteem, lower chances to achieve success in life, lower chances to have a happy life, and so on. That is why there is a great deal of people who are extremely interested in various hair loss treatments, and there is a great deal of various options for them to choose from, starting from using herbal remedies and various natural hair loss treatments, and ending with surgeries and other radical ways to bring the hair back. Laser therapy is one of quite popular hair loss treatments, especially innovative technologies of laser home treatments. It has been used for many years to assist smokers to give up their nasty habit and break this terrible addiction. A decade ago it was discovered that laser treatment can be successfully used in hair loss treatment, too, and low-laser beams could help not only in nicotine addiction breaking, but also in improving hair follicles quality, this way making our hair thicker and richer. For many years laser therapy has been used as an effective clinical treatment both for male and female hair loss pattern. However, not too long ago, special systems of using laser at home were developed, allowing millions of people prevent and treat hair thinning and loss without running to the clinics or beauty spas. Laser home treatments are known also as laser brushes, which can be used by everyone on a daily basis. There is a variety of such laser brushes currently in the market, and iRestore Hair Rejuvenation System is one of those. Laser home treatments also allow us to save money as they cost about 300-600 USD compared to using professional laser hair loss treatments which can cost up to 4,000 USD a year. « Treating Male Baldness With Leg Hair?? 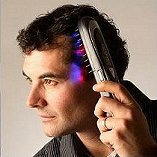 Use of low level laser therapy (LLLT) devices for treating hair loss has been heavily debated for some time by reputable hair restoration physicians and patients on our hair loss forum. While some physicians reject its use entirely, others use laser hair treatment as a regular part of their practice. I do however, want to clear up some misinformation in your article. Laser therapy has not been FDA “approved”, it’s been “cleared” based on substantial equivalence to previous devices.